Home > Guides and Tips > Having Problems with iPhone Push feature? Today I faced a problem on my iPhone where I couldn’t get push notifications to work using Go and STC routers. I have finally found a fix. It turned out to be a DNS problem and all you have to do is to set the DNS on your iPhone. I hope this will be useful to anyone having this problem. So first of all we need to click Settings. 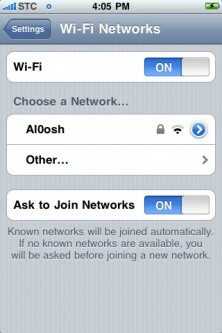 Click on the blue arrow next to the Wi-Fi access point name. In the DNS option we need to clear the value and enter: 194.150.168.168 then go back to Settings and click the home button. Push notifications should be working by now. Push notifications can be used to notify you withÂ any new messages on IM messengers, Mail, and a lot of other apps. Note: if you need to revert at any time all you need to do is delete everything in the DNS field. Thank you for reading.. waiting for your replies! Tried it twice. It didn’t work for my iPhone, instead I can’t connect to internet at all. @Eric Hi. First of all did you have any problems with the iPhone Push feature. if u did, then please check the DNS number u wrote is written correctly. if you are sure it does not work then you can try to use 208.67.222.222 instead. if none of these works, then just delete the DNS number and it will go back to default. I have tested this on 2 iPhone and 1 iTouch and it’s working great. Thank you..it worked! I did not know that I had a Push notification problem, my problem was that I could not connect to the internet after coming back from an out of Kingdom trip, and I keep getting a “Could not activate cellular data network” msg! Thank you again and I hope I don’t use the connection again! soo ur active on games, on mobile review , alos help on yahoo question.. btw just saw ur question regarding the how to transfer account from yahoo to hotmail..
and u have a newat blog page.. not to mention the facebook account is cool too..any hooo.. add me back on ur yahoo. i thought i got he wrong address cause i didnt get the confirmation. good review.. only prob is i am an official apple / macintosh hater. i dont belive in unreal prices.